6 Plain Cupcakes piped with fluffy buttercream. 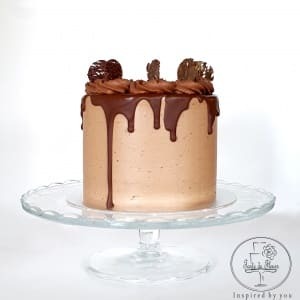 A rich chocolate sponge filled with silky chocolate buttercream and drizzled with milk chocolate. Edible Flowers Lollipop perfect for wedding favours, corporate events, birthday parties or a lovely addition to a dessert table. A stunning floral cake, flavoured with rosewater and layered with vanilla buttercream and roses jam, decorated with edible rose petals. Celebrate your baby boy 1st birthday in style with our personalised elephant birthday cake. You can add their name or date of birth to this delicious and adorable cake. Make their 1st birthday a memorable occasion with the perfect cake! 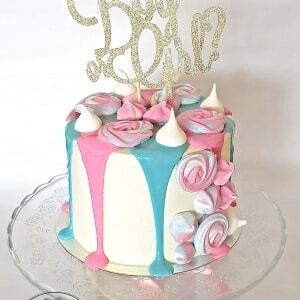 Festive gender reveal cake for a gender reveal party or baby shower! Such a fun way to share the exciting news! Gluten free sponge with whole blueberries filled with silky blueberry Swiss meringue buttercream. Beautiful contemporary design birthday cake. Concrete effect and handmade gold chocolate sails. Our gorgeous Heart Lollipop Favours with edible rose petals are the perfect gift for wedding and event guests. Four layers of moist vanilla sponge with fresh raspberries, filled with raspberry Swiss meringue buttercream and decorated with fresh raspberries and meringues. Our super fun Sprinkles lollipop favours are the perfect gift for your wedding or party guests. 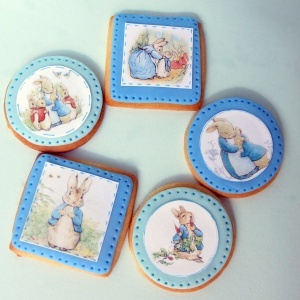 These cute and elegant treats could also be a lovely addition to your dessert table or party bag fillers. Four layers of moist vanilla sponge, filled with vanilla Swiss meringue buttercream and homemade strawberry jam. Nobody would ever believe this chocolate cake is vegan, it’s really that good! This beautiful, elegant and trendy dessert is perfect for parties, birthdays, weddings and anniversaries. This spectacular buttercream flowers cake is perfect for birthdays, special occasions or a lovely addition to an afternoon tea party. Subscribe now to get a Promo Code! Already 256 subscribers are on the list. © Copyright Tarte de Fleurs 2018. All Rights Reserved.